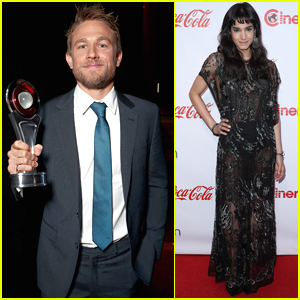 Charlie Hunnam & Sofia Boutella Are Honored at CinemaCon Achievement Awards! Charlie Hunnam is all smiles after receiving his Male Star of the Year Award at the CinemaCon Big Screen Achievement Awards on Thursday night (March 30) The Colosseum at Caesars Palace in Las Vegas. The 36-year-old actor was joined at the event by Sofia Boutella – who was honored with the Female Star of Tomorrow Award. 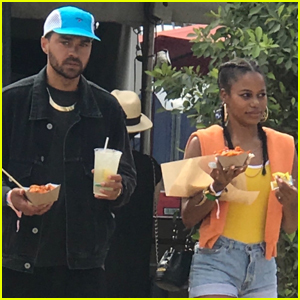 Other stars who were honored at the event were Jordan Peele and John Cena along with Kumail Nanjiani – who was joined at the event by Emily Gordon. Jessica Chastain looks pretty in a floral-print dress as she arrives at the 2017 CinemaCon Big Screen Achievement Awards on Thursday night (March 30) at The Colosseum at Caesars Palace in Las Vegas. 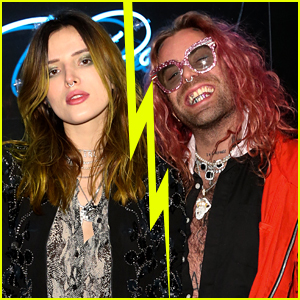 The 40-year-old actress was joined at the event by fellow actresses Naomi Watts, Salma Hayek, along with Snatched co-stars Amy Schumer and Goldie Hawn. Inside the awards event, Jessica took home the award for Female Star of the Year Award while Goldie was awarded with the Cinema Icon Award. Salma was also honored with the Vanguard Award as Naomi received the Distinguished Decade of Achievement in Film Award during the CinemaCon Awards. FYI: Jessica is wearing a Zuhair Murad dress and Stuart Weitzman heels. Naomi is wearing a Miu Miu dress, bag and shoes with an Eva Fehren ring and Monique Pean jewelry. Salma is wearing a Bottega Veneta dress. 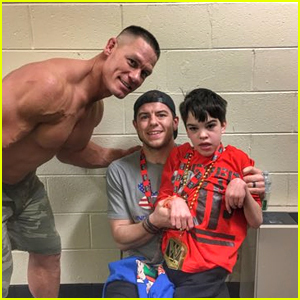 John Cena Meets with 12-Year-Old Super Fan After WWE Event! John Cena made the dreams of one of his biggest fans come true! The 39-year-old pro wrestler and actor met with 12-year-old Payton Marion – who has cerebral palsy – at a WWE event recently in Tennessee. During the event, John tossed Payton and his dad Justin a T-shirt and wristband before meeting them back stage. Justin shared that with Local8 Now that when Payton attends his physical therapy, he uses John as his inspiration. “The fact that my son was able to meet one of his heroes, my heart melts, and it was just crazy,” Justin said. Watch the video Justin posted of the meeting below! Also pictured inside: John Cena promoting his upcoming animated film Ferdinand at CinemaCon 2017 on Thursday (March 30) at The Colosseum at Caesars Palace in Las Vegas. Things got a bit intense on set of The Greatest Showman! While promoting his upcoming film Baywatch, Zac Efron shared that while he was recently filming a scene from Showman with co-star Hugh Jackman, the building they were filming in caught on fire. Don’t worry though – both actors are doing just fine after their fiery escape. Also pictured inside: Hugh Jackman promoting The Greatest Showman on stage at CinemaCon 2017 on Thursday (March 30) at The Colosseum at Caesars Palace in Las Vegas. Amy Schumer and Goldie Hawn share a laugh on stage at CinemaCon 2017 on Thursday (March 30) at The Colosseum at Caesars Palace in Las Vegas. The funny ladies attended the event to promote their upcoming mother-daughter comedy Snatched. Snatched follows impetuous dreamer Emily Middleton (Amy) after her boyfriend dumps her on the eve of their exotic vacation. She then persuades her ultra-cautious mother Linda (Goldie) to travel with her to paradise. While they were at CinemaCon, the actresses shared a new clip of their upcoming film – which Amy then shared on her Instagram for her followers to see. Snatched hits theaters on May 12. Watch the new clip below! Charlie Hunnam wasn’t sure if his Lost City Of Z co-star Robert Pattinson liked him or not during filming. The 36-year-old actor recently opened up about how they tried to stay in character off screen. Pictured: Charlie promotes King Arthur: Legend Of The Sword at 2017 CinemaCon at The Colosseum at Caesars Palace on Wednesday (March 29) in Las Vegas.